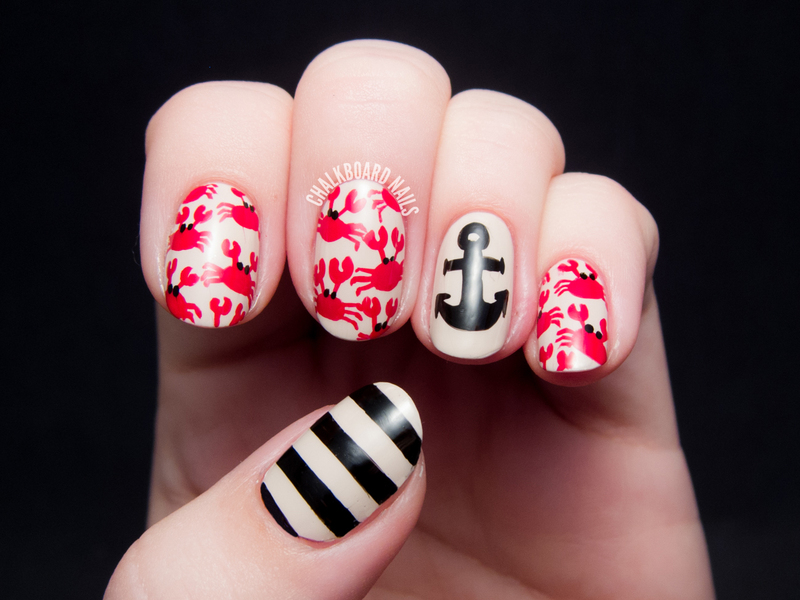 The crab print was a brilliant idea from my friend Kristi, and I decided to add a bit of nautical flair into the mix with the thick stripes and anchor. I painted all of the elements freehand with one of my new liner brushes from Stylish Nail Art Shop. 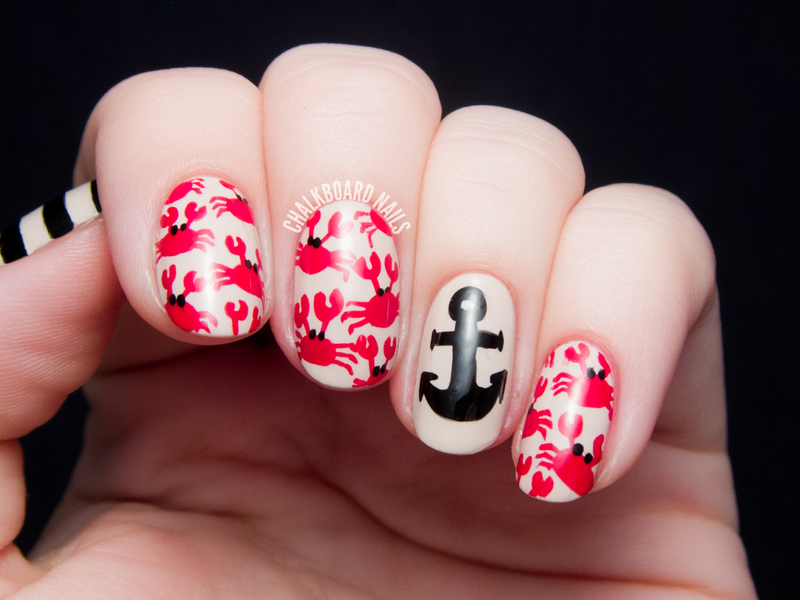 I love the way this miniature crab print turned out, and I'm especially proud that I freehanded the stripes on my thumb. I still struggle with horizontal stripes so this feels like a real win for me! These are adorable! Great way to start the 31 days! Those stripes are perfect! 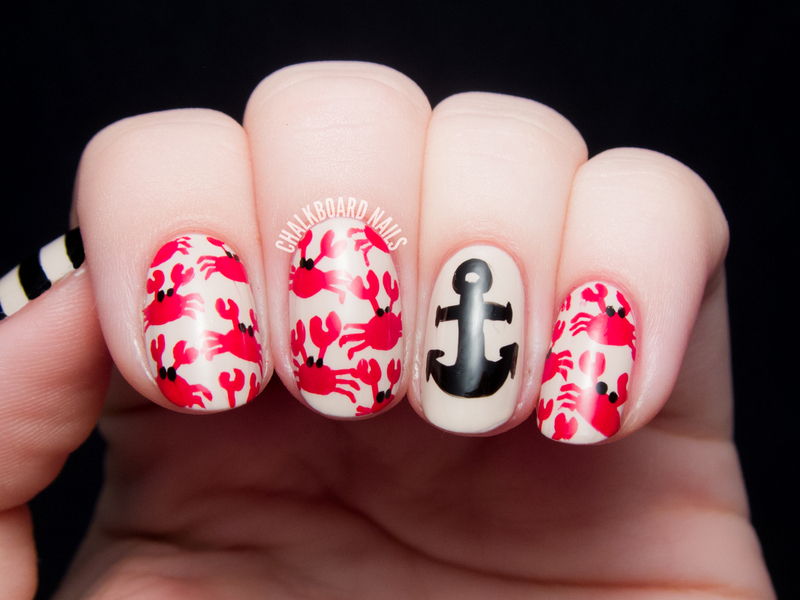 Your little crabs are so cute - wish I was capable of doing this myself! Wow, I'm so impressed at your freehand skills! This looks great! The Crabs are so cute!! I did red lighting bolts for today. Can't wait to see what you do tomorrow for orange!! This is incredibly cute! I just love everything about it. those little crabs are just the bees knees. or something! This is ridiculously adorable! And those lines! Amazing. So cute! I lived in Maryland for quite a while, so I love me some cute little crabs! The crabs! Oh, the crabs!! Awww cute crabs!! How can you draw such straight lines?! You're amazing!! I am in awe of your freehand skills. Those crabs are sooooo cute!!! love it. Oh my goodness, those cabs are too cute!